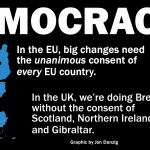 In all democracies, it’s essential that elections – including referendums – are run fairly, and that the regulatory authority has the power to annul an election or referendum if serious irregularities may have affected the result. That’s not just my opinion. 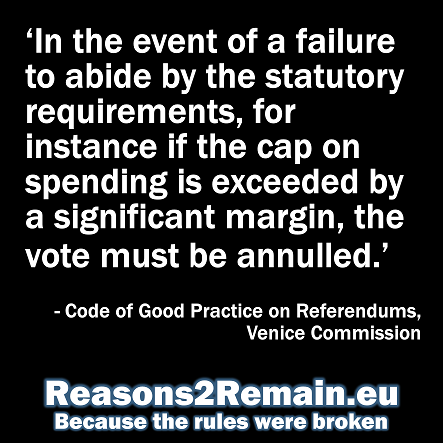 Such a requirement forms part of the Venice Commission’s ‘Code of Good Practice on Referendums’. The Venice Commission is an advisory body of the Council of Europe, and the UK’s Foreign Secretary, Jeremy Hunt, currently sits on its Committee of Ministers. I asked the Commission if they have the power to annul a referendum, in accordance with the recommendations of the Venice Code. 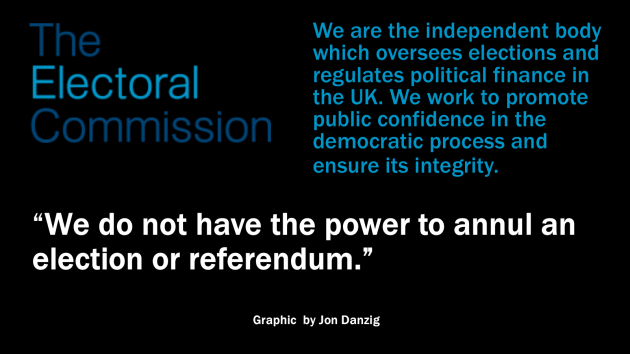 If the Electoral Commission had the power to annul a referendum, then it’s unlikely that members of the public would now be needing to call on the High Court to declare the EU referendum “void” as a result of serious irregularities. The Venice Commission’s Code states that a final appeal to a court must be possible. The case of Susan Wilson & Others versus The Prime Minister is scheduled to move to a preliminary hearing on 7 December. The case will argue that Brexit must be declared void and the notification of Article 50 quashed because, “various criminal offences may have been committed”. Currently the National Crime Agency’s (NCA) is conducting an investigation into suspicions of “multiple” criminal offences committed by Aron Banks and the Leave.EU campaign that he founded. Both Leave.eu, and the official Vote Leave campaign, have already been found guilty of breaking electoral law in the referendum. The Independent reported this weekend that the government is expected to deploy Sir James Eadie QC – the star barrister who led the unsuccessful battle for the government to trigger Article 50 without parliament’s consent – in a sign of the case’s importance. “Since the outset, the behaviour of the Leave campaigns has undermined British democracy. “Bad enough that they lied and misled the public on an industrial scale, but they added insult to injury by breaking electoral law. “The Electoral Commission proved the scale of the misdeeds but have no power to act, so that task was left to members of the public like myself, who felt we had no choice but to act. The Electoral Commission’s representative explained to me how the the current law is time limited in so far as challenging the result of an election or referendum. “The only way an election result can be challenged is if a petition is launched within 21 days to the Elections Petitions Office at the High Court. We include details in our guidance for candidates which you can see on this link (paragraph 1.10 onwards). “With regards to the EU Referendum, the referendum result was likewise only subject to challenge by way of judicial review. Any challenge to the EU referendum result must have been brought before the end of six weeks beginning with the certification of the ballot papers counted and votes cast. “As you can see, these processes are set out in law. Any change to the law would be for the Cabinet Office to make. I should add that the UK’s Law Commissions’ made a series of recommendations in 2016 to modernise electoral law which we wholeheartedly support. So, my next call was to the UK government’s Cabinet Office, which is a department of the Government “responsible for supporting the Prime Minister and Cabinet” and ensuring “the smooth running of government”. In charge of the Cabinet Office is David Lidington, who was previously a Minister for Europe. 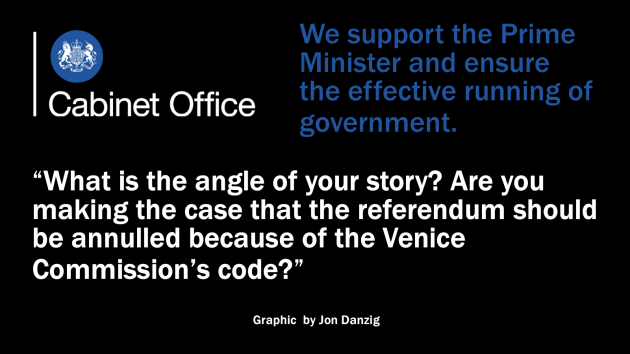 I shared the Venice Commission’s code with Mr Lidington’s office and reported back what the Electoral Commission had told me. I queried why the Electoral Commission does not have the power to annul an election or referendum, as recommended in the Venice Commission’s code. What is the government’s view about the Law Commissions’ recommendations, especially in regard to making it easier to challenge an election or referendum result? If serious irregularities are discovered in a UK election or referendum, should it not be possible to challenge this beyond the current very short deadline? 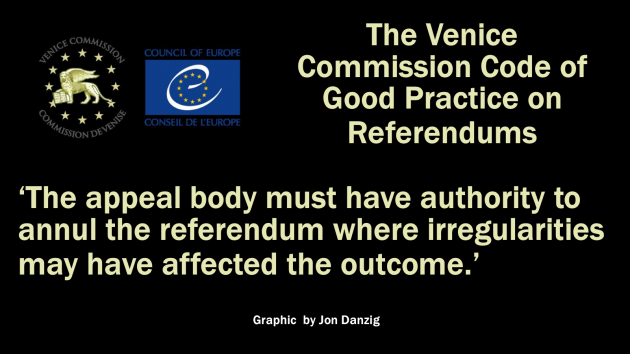 Why doesn’t the UK follow the Venice Commission’s Code of Good Practice for Referendums, by allowing an appeal body (presumably the Electoral Commission in this case) to have the power to annul an election or referendum where “irregularities may have affected the outcome”? Is the government planning any new legislation in this regard? “Your second question I think should be directed to lawyers, it’s not something we could answer. So, I went back to the Electoral Commission to ask them if it was still their view that the referendum “was well run” as claimed by the Cabinet Office? 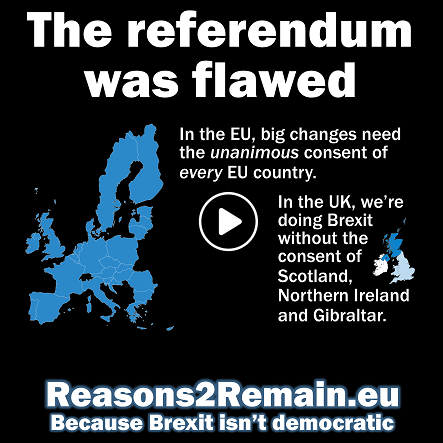 “We published a report on the regulation of the referendum in March 2017 and made recommendations to the UK Government about how there need to be improvements made to the rules ahead of any future poll. “There are concerns about the conduct of the Referendum campaigns because evidence is emerging of alleged fraud, and criminal acts by Vote Leave, Cambridge Analytica, and Aggregate IQ: illegal overspending, psychologically profiling and targeting people with online ads, based on stolen data. “This issue has become even more serious because the legal opinion of three barristers is now public on how Vote Leave, and its organiser Dominic Cummings, allegedly committed criminal offences. “In addition, Leave.eu has been fined the maximum amount possible by the Electoral Commission for multiple breaches of electoral rules, and in addition fined by the Information Commissioner’s Office for serious breaches of data laws. “Furthermore, suspicions about the source of millions of pounds loaned to Leave.eu by Arron Banks is now the subject of a criminal investigation by the National Crime Agency. “However, I am not in a position to judge whether these irregularities in themselves were of such a magnitude as to have affected the result of the referendum. “The point of my email to you, and of my article, was to enquire why it is in the UK that our Electoral Commission does not have the power, as specifically required in the Venice Code of Good Practice for Referendums, to annul an election or referendum result if it is deemed that such irregularities had affected the outcome. “Are you able to provide an answer? “I would of course, not expect the government to comment on such a contentious question as to whether the irregularities in the referendum were sufficient to have nullified the result. “My question was more general: why is there no power by the regulatory authority to annul an election or referendum result if irregularities are discovered that could have affected the outcome? Lawyers may have an opinion on this, but it will depend on the current law, and the powers conferred onto the regulatory body. “Which comes to my fourth question on what is the government’s view of the UK’s Law Commissions’ recommendations in 2016 to modernise electoral law, especially their recommendation to make it easier to challenge an election or referendum result? “Does the government support these recommendations? Is the government planning any new legislation in response to the Commissions’ recommendations? If not, why not? “An Act of Parliament is required before any UK-wide referendum can be held. There are thorough parliamentary procedures in place to ensure that any referendum legislation is scrutinised and debated. This seemed to be an entirely inadequate response to my questions to the government. I asked the Venice Commission to comment, but they replied that they did not ‘have a mandate’ to comment on the situations in member states. I also asked how many of the Commission’s member states have an appeals body that has the authority to annul a referendum or election result in the case of serious irregularity? They plan to have this information available next year. The Venice Commission (also known as the European Commission for Democracy through Law) is the Council of Europe’s advisory body on constitutional law. The Council (which is not part of the European Union) was founded in 1949 to uphold human rights, democracy and the rule of law in Europe. 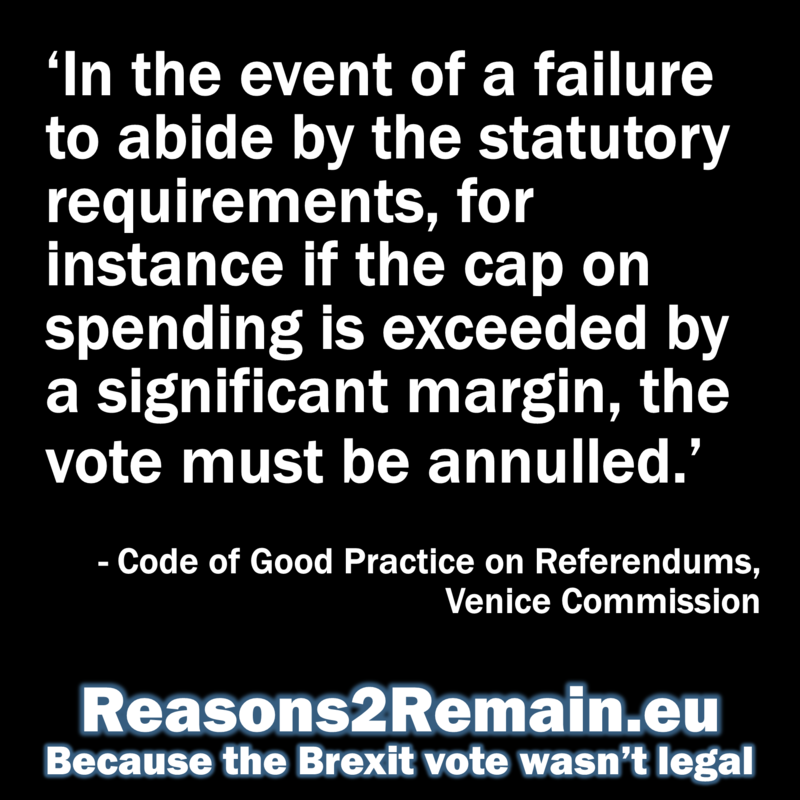 Although the Venice Commission’s Code of Good Practice on Referendums is a voluntary code only, it was set up for a reason and has been accepted by the Committee of Ministers where all member states, including the UK, sit. It’s becoming increasingly clear that there were serious and illegal irregularities in the EU referendum of 2016 that, over two years later, we are only now learning more about, with criminal investigations still ongoing. The law as it currently stands does not provide an easy or effective way to challenge an election or referendum result. This is wrong. Leave.eu has been fined the maximum amount possible by the Electoral Commission for multiple breaches of electoral rules, including exceeding the cap on spending by a significant margin. These, I believe, are sufficient grounds to annul the referendum. But also ongoing are criminal investigations as to the source of £8 million of funds that Arron Banks, the founder of Leave.eu, “loaned” to the campaign. The Electoral Commission suspect that these funds may have come from foreign sources, which would be illegal under UK law. This is currently the subject of a police investigation. If proven, the case against the referendum being valid would be unassailable. “Most people voted for Brexit because they are honest: they believed promises and arguments about the EU’s democratic deficit or investing in the NHS. “It is clear that certain organisers of Brexit were prepared to say anything, do anything, with anyone’s support, to get the result. We await the verdict of the High Court. But the bottom line? The referendum result is unsafe. We cannot possibly proceed to change our country forever based on such a dodgy ‘election’. 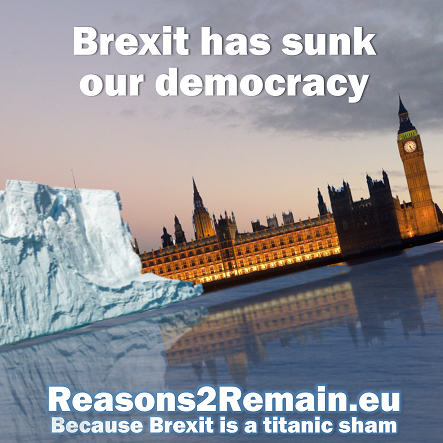 This entry was posted in Current Affairs, Democracy & Citizenship, Law & Justice, Politics & Public Policy, The EU and tagged Article 50, brexit, Cabinet Office, Electoral Commission, EU referendum, European Union, Susan Wilson, Venice Commission. Bookmark the permalink.